If it’s a holistic holiday that you seek, with some cleansing of the mind in a spiritual ambience and scenic retreat, with rejuvenation and a visit to holy destinations, then sojourn to Haridwar, that Mecca of devotees! 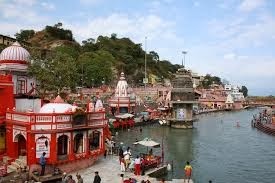 One of seven major holy places for Hindus and situated in the sprawling state of Uttarakhand, there are a plethora of Places to visit in Haridwar! Perhaps it would be most appropriate to begin our enriching excursion of places to visit in Haridwar with places most sacred to Hindus, symbolized by the “Panch Tirth”(Five Pilgrimages) within Haridwar itself. These comprise Gangadwara (Har ki Pauri), Kushwart (Ghat in Kankhal), Bilwa Teerth(Mansa Devi Temple) and Neel Parvat (Chandi Devi Temple). There are several other temples and ashrams located in and around the city, worthy of a visit! Constructed in the 1st century B.C. by king Vikramaditya, the most sacred ghat within Har-ki-Pauri is Brahmakund. The evening prayer (Aarti) offered to Goddess Ganga at Har-Ki-Pauri is an enchanting experience and is followed by pilgrims floating lighted diyas (floral floats with lamps) and incense on the river, in a riveting spectacle of sound and color! Some of the other enchanting places to visit in Haridwar encompass the beautiful white marble Doodhadhari Barfani temple at the ashram complex of Doodhadhari Barfani Baba, Sureshwari temple in the midst of the Rajaji National Park, rich in animal life and Anandamayi Maa ashram; Sapt Rishi Ashram and Sapt Sarovar, a picturesque place near Haridwar where the seven sages meditated, constitutes a fitting finale!